"I wanted a great GREEN recipe for St. Patty's day but couldn't really find one, so I came up with this and hopefully everyone will get into the St. Patty's spirit with green deviled eggs!" Place eggs in a saucepan and cover with water. Bring to a boil, remove from heat, and let eggs stand in the hot water for 15 minutes. Remove from hot water and chill at least 30 minutes in a bowl of cold water or in the refrigerator, until eggs are cold. Prepare egg dye according to package directions in a large metal or glass bowl. Gently crack eggs but do not remove shells so that the egg dye can reach the egg whites. Place the cracked hard-cooked eggs into the dye, working in batches if necessary, until dye seeps through the cracks and colors the eggs slightly, about 5 minutes per batch. 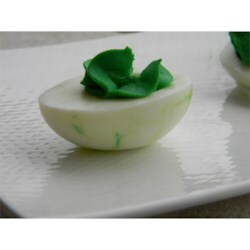 Rinse eggs and peel to expose the green marbled color; slice eggs in half lengthwise. Scoop egg yolks into a bowl and mash with a fork and mix in the mayonnaise and celery; stir green food coloring into the yolk mixture. Spoon the yolk mixture into the egg halves; top each egg half with a parsley leaf. Stout and Irish cream liqueur flavor this dense chocolate cake.